Haryana Roadways Conductor Final Result 2018 - Haryana Roadways Conductor Station Allotment 2018 HSSC Conductor 2nd Selection Final List - HRTC 2968 Conductor Recruitment 2017-18 Application Form - www.hartrans.gov.in. 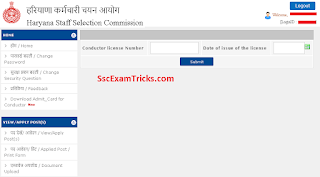 Latest news (02.12.2018) – HSSC Conductor Final Result has been declared now. The final selection list has been released now in which roll number wise candidates have been shortlisted for the appointment / joining on the posts of 905 conductors in the various departments. The final selection list can be downloaded from the link given here. Haryana Staff Selection Commission has declared the result of Haryana Roadways conductor exam held on 10th September 2017 and 17th September 2017 for conductor in Transport Department Haryana against advertisement number 4/2017 category number 2. Eligible candidates who qualified the written test are called for scrutiny of documents for document verification as per eligibility rules. The document verification is done to check the eligibility condition of the candidate. Scrutiny of Documents of the candidates will be held from 15.09.2018 to 19.09.2018. It is mandatory for the candidate to reach the venue at 9 a.m. at commissioner's office Bay number 67-70 Sector 2 Panchkula with all original document, effect of self attested copies of all documents, one ID proof and copy of downloaded application form. Today, the good news is that HSSC has uploaded Roadways Conductor Admit card on official website. The candidates must bring/use conductor license number and date of issue before downloading online call letter. First, login their account by using login ID and password (same as provided during submission of online application form). After opening the account, the candidate check the admit card link given at the right column (below feed back link). 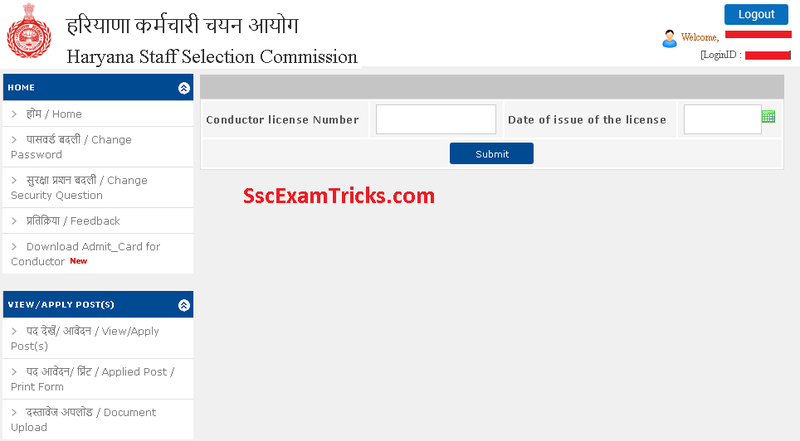 Click on that link and enter conductor license number and date of issue. Finally press 'Submit' button. Note down the date, time and venue of examination. Don't forget to download 'All three page'. First is admit card for office, second is instruction page and third is admit card for candidate. Bring original photo ID proof at the exam centre. However, HSSC has committed to upload the online admit card on 04th September 2017, but it has not been uploaded by the commission and the candidates are still waiting for their online admit card. The news from the resources is that HSSC website is still busy on uploading process of HSSC Conductor Admit card and it is expected that these admit card will be available tomorrow (05.09.2017) around 11:00am on official website. The good news is that HSSC exam date notice has been uploaded for conductor under Advt. No. 4/2017 Cat. No. 2 in which the written exam has been scheduled on 10th & 17th September 2017 in Morning session from 10:30am to 12:00noon as well as evening session from 03:00pm to 04:30pm. Haryana Roadways conductor exam Admit card will be available online on 04.09.2017 at www.hssc.gov.in. The reporting time for Driver exam will be 09:30am. The exam will be held at Ambala, Kurukshetra, Karnal & Panchkula districts. The final merit list will be 225 marks in which written test (200 marks) and interview marks (25 marks) will be conducted. The rest of the exam pattern will be same as held for driver exam. The written exam will be of 200 marks in which objective types of questions will be given to the candidates. The mode of examination will be Offline / OMR sheet/ Pen-paper mode. The exam will contain two parts in which 75% questions will be asked from General Awareness (Reasoning, Math, Science, English, Hindi and related) while the rest of questions (25%) will be asked from History of Haryana, Current Affairs, Geography, Civics, Environment, Sanskrit etc. The interview / viva voce will be of 25 marks only. · Candidate go to the official website of department of state transport, Haryana at www.hartrans.gov.in. · Click on the Haryana roadways driver / conductors / technician link. · Now click on new registration link. · Fill the full application form with correct details. · Click on save button. · Click on upload photo and signature link. · Upload the latest photo and click on save button. · After that upload the signature and click on save button. · Now pay the online application fees of the form. · Verify all the details you entered again before proceed. · After that click on proceed button. · Your application will be submit. · Now take the print of your application form by providing the registration no. and password. 2. Enter your login details such as user name and password. 3. Press ‘login’ button and download your HSSC Roadways Final Result 2018 for Driver Conductor.